Reduced security of electricity supply and serious job losses are the potential consequences of the closure of the Territory Generation power station in town and the commissioning of the new Owen Springs facilities, says Electrical Trades Union NT organiser, David Hayes. The buzzword of the new system will be “response rates”: The changes in these will be substantial if the Ron Goodin power station is closed later this year. It is in immediate vicinity of the Golf Course Estate, and a long term noise headache for its residents. The Owen Springs power station is at Brewer Estate, 30km south of town. This is what happens at present when there is a generator failure in Alice Springs: The fault alarm goes to Ron Goodin which can remotely operate Owen Springs. Mr Hayes says a stand-by engine, if it is at Ron Goodin, can be started and brought up to full load – best scenario – in two minutes. That would be how long a part of the town would be without power. If a MAN engine at Owen Springs needs to be used, the start-up time would be about 10 minutes, although the MANs are actually younger than the Ron Goodin motors which approach 50 years. When the 10 new gas-fired engines at Owen Springs come on stream, the response times will be similar, except these brand new engines will be slower to start than the old Pielstick and Mirrlees engines at Ron Goodin. The Remote Operating Centre (ROC) in Berrimah will take charge. By the way, that centre is only Cyclone Two proof. If a category three cyclone hits it will need to be evacuated. There will be a stand-by control centre in Alice Springs but there will be no staff here trained to run it. So, fast forward to ROC being up and running, Ron Goodin being shut down, and a fault occurring. An engine in Owen Springs will be started automatically – except that technology has not yet been proven under local conditions. An engine may be hard to start and a “manual turn” has to occur. In that case the ROC operator will contact an on-site operator at Owen Springs, and he or she will respond accordingly. This will still incur a delay of about an hour. The problem, says Mr Hayes, is that the ROC operator in Darwin is looking after about 35 to 40 engines at Darwin, Weddell, Katherine, Tennant Creek, Katherine and Yulara. At night the ROC will be manned by a single person. The concern is, if the sole operator is busy with a Darwin fault, Alice Springs will have to wait. There will be a single person at Owen Springs at night, and that person will not be monitoring engines, a function transferred to Darwin. “We’ll be losing local control,” says Mr Hayes. The ROC person may not be familiar with Alice Springs in the event of a network system fault – that is the network of lines. There are only two lines from Owen Springs to Alice Springs. Both lines go into the Lovegrove Drive sub-station. Lines and transformers require regular maintenance which means they need to be taken out of service at least three times a year, for about a week each time, around a total of one month a year. This means in turn that the entire output from Owen Springs is carried on one line, instead of two. If that becomes unserviceable, at the moment Ron Goodin takes over – but not for much longer. “Running on one line is an extreme threat to supply security,” says Mr Hayes. That means that if there is a fault on that line then Alice Springs will be without power for the time it takes to rectify the fault or restore the out of service equipment if that is possible. 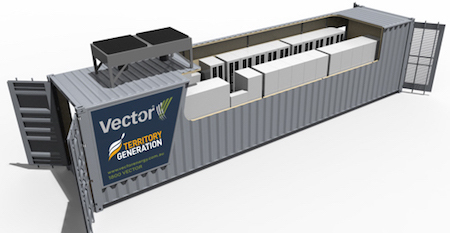 The new Vector storage, announced with fanfare by TG last week, system will sit at the Ron Goodin site but it will not have enough power stored to run the entire town. In a low-consumption period the storage system would supply a quarter of the town for 10 minutes. In hot weather, at peak consumption, this storage will be completely useless. So what is the role of the Uterne solar plant behind Radio 8HA, on the South Stuart Highway? On a bright, sunny day it contributes 15% of the demand in low consumption periods. Does that mean it saves 15% of the gas burned? No. It saves some but not 15%. This is how it works: The risk of shutting down engines would be too great because cloud movement can cut solar output in minutes, maybe seconds. In order to substitute for lost solar quickly the engines need to be kept running at – say – 50% of power, which is not ideal in terms of engine performance. So gas will be burned while solar power is available and is being used – a waste on the face of it, but necessary. This is where the storage system will help: It will be a buffer between the time clouds stop solar output and more engine power kicks in. There are also significant human resources issues: Staff morale is at an all time low because closure of Ron Goodin is causing stress, uncertainty within the workforce, says Mr Hayes. TG is talking about redeployment to Owen Springs but TG “is not listening to local staff,” he says. “HR advisers from interstate are cutting wages and conditions and safety has gone down hill. “They issue statements about safety but it is concerning what is really happening. They talk about corporate safety goals, but ignore safety concerns raised from the workforce. The permitting systems – for maintenance to occur – were to some part implemented without staff having a say. It has taken a lot of pressure to get that back on track, with more work to do. Initially it seemed Alice Springs would lose 50% of its TG staff, from 40 positions down to 12, “but we have negotiated an increase of seven people, with more talks to take place after July 1”. Owen Springs is currently running on three MAN piston engines, which are started on diesel and running on gas, and on one gas turbine. The installation of the 10 new piston engines running on gas was at the centre of a ferocious controversy when Chief Minister Adam Giles spent $75m on them in 2015. Environmentalists argued that a significant part of this amount should have been spent on renewables. Ron Goodin has nine ageing piston engines and one turbine. Ron Goodin is running to an unnecessary extent on diesel, which is much dearer than gas. Just one engine will burn 1500 litres of diesel in an hour. “Is that a strategy to make Ron Goodin look bad compared to the new controversial Owen Springs station?” says Mr Hayes. TG CEO Tim Duignan announced Vector Energy as the preferred supplier to install a 5MW Battery Energy Storage System (BESS) which “would change the face of Alice Springs as it transitions to a renewable energy future. The total cost of $8.3m would, on a simple payment basis, be recouped within four or five years due to the efficiencies and savings realised. The system is expected to be completed by late 2017. We have asked Territory Generation to respond. 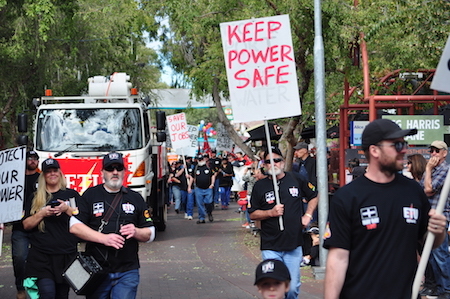 PHOTOS from top: ETU members at the Bangtail Muster parade this year • The 5MW battery storage system • A nice aside to the story: Ron Goodin’s son Cameron, who completed his apprenticeship at the local power station and went on to work in the mining sector for many years. He married a local girl, Kerry, and now lives in Sweden with their two daughters. 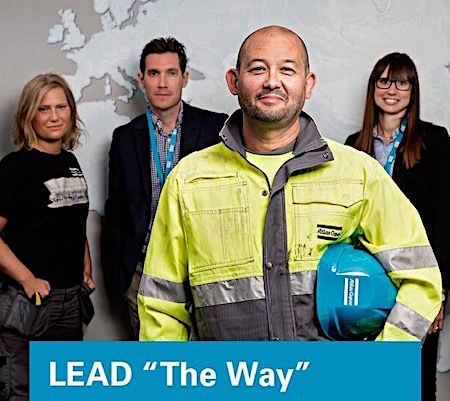 Mr Goodin is a poster boy for Atlas Copco. He now travels all over the world with the company. This image from an Atlas Copco advertisement was sent to us from an Alice Springs friend of Mr Goodin’s. The renewable energy option is making even more sense now. More decentralised power, more battery storage, more local ownership and less reliance on Darwin. I wish the ETU well with trying to sort this one out! It does sound as though there is a commonality of interest with us electricity consumers. The cloud cover problem is obviously a significant one for Alice Springs, with summer storms being a frequent event when there is peak electricity use for airconditioning. Is there anyone here who can give us some numbers for or against the idea? It seems monumentally wasteful to be running a generator on gas for the sake of standby power. A wholly owned NT government power supply … warnings to get ready for increased power failures … hmm … sounds suspiciously like a softening up process to get the electorate ready for a sell-off to private enterprise – in the name of better efficiency, and a short term profit in a black line government budget. It happened down here in Mexico. It seems that potential problems are being built into the supply. Is this simply cost cutting, or an attempt to make us all turn to supplying our own power sufficiency much like is happening in South Australia where companies with refrigeration plants and essential services are being forced to install expensive back-up generators? Here in the NT where the Government owns the supply it seems less than satisfactory. Next summer seems we are being softened up to accept regular power outages.